Autologous mature adult cells as well as stem cells, which are not considered pluripotent, have been reported to be safe and efficacious in clinical applications for regenerating cartilage  and corneal epithelium . Use of primary autologous cells and stem cells expanded in number from cartilage and corneal epithelial tissues have shown abilities to reconstruct and regenerate tissues, de novo. It is to be noted that in both these cases, the source of the cells that have been used for transplantation into the cornea and cartilage have been from the same organ and tissue. The replacement cells for regeneration have also been sourced from the same germ layer, as that of the cells of the target tissue; corneal epithelial tissue embryologically originating from the ectoderm has been replaced with corneal limbal stem cells that are also of ectodermal origin from the unaffected healthy eye of the same individual. Similarly, the cartilage which developmentally is from the mesoderm has been replaced with mature chondrocytes from the non-weight bearing area of the cartilage, again of the same individual. Figure 1: Autologous, in vitro cultured, adult cell based therapies; An overview and categorization. 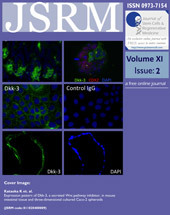 The proceedings of the IIDIAS session published in this issue have described two novel cell therapies, where cells taken from a tissue or organ, after normal in vitro expansion, have been clinically applied to aid the regeneration of a different tissue or organ, i.e skeletal myoblasts having been used for myocardial regeneration and buccal mucosal epithelium having been used for corneal epithelial regeneration heralding the birth of a new paradigm called ‘extra-anatomic cell therapy’. The myocardium is a specialized muscle in that it works as an electrical synctitium with an intrinsic capacity to generate and propagate action potentials (involuntary) as opposed to the skeletal muscles that are dependent on neuronal stimuli (voluntary) and lack propagation of action potentials. However, the skeletal myoblasts in vitro, expanded as patches, have aided the in situ regeneration of the dysfunctional myocardium by secreting relevant growth factors . Similarly, the buccal mucosal epithelium which is an opaque tissue has been applied to regenerate the damaged corneal epithelium, which in contrast is a transparent tissue. Here the buccal mucosal epithelium has been found to replace directly the dysfunctional corneal epithelium to assist in its regeneration and the resumption of proper function . Though the source of the cells taken for repair of cartilage and corneal epithelium are extra-anatomic, they belong to the same germ layer of developmental origin; skeletal myoblasts (source) and cardiomyocytes (target) both from the mesoderm while buccal mucosal epithelium (source) and corneal epithelium (target) are both from the ectoderm. 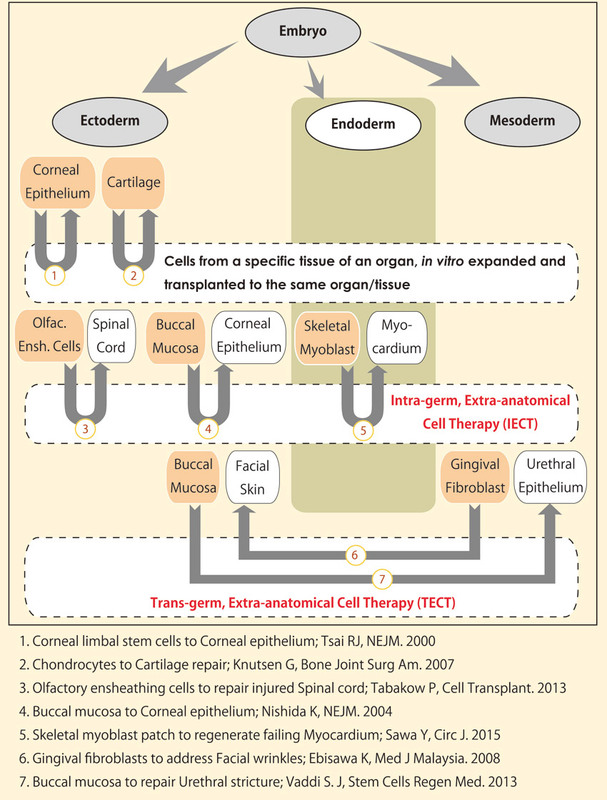 Extra-anatomic cell therapies reported in the literature such as the transplantation of olfactory ensheathing cells in spinal cord injury  also fit into this association, as the cell source for the replacement and the target organ exist within the same germ layer of ectoderm, developmentally but separated regionally. 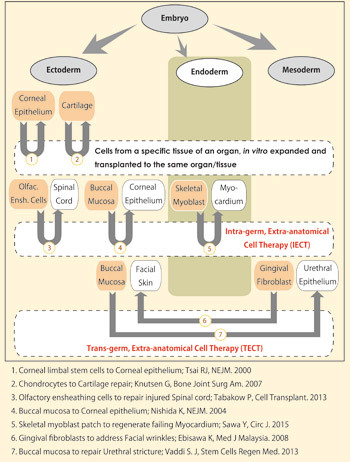 All these exchanges, we propose, should be termed as “Intra-germ Extra-anatomic Cell Therapies” (IECT). We have come across two extra-anatomic cell therapies that have been reported in the literature, where cells of the source and target tissue have different embryonic origins. Firstly, the transplantation of in vitro expanded buccal mucosal epithelial cells to treat urethral strictures in the “BEES-HAUS” (Buccal Epithelium Expanded & encapsulated in Scaffold - Hybrid Approach to Urethral Stricture) approach reported by Vaddi et al  and secondly the use of gingival fibroblasts to replace the lost dermal fibroblasts in cell therapy for facial anti-aging  by Ebisawa et al both fall under this category. The buccal mucosal epithelial cells (source) originate from the ectoderm while the epithelial lining of the urethra (target) arises from the endoderm and the process of dysfunctional cell replacement occurs within the target. Gingival fibroblasts originate from the neural crest (source) while dermal fibroblasts are derived from mesoderm (target) and the process that follows is again replacement of dysfunctional cells. These, we propose, should be termed as “Trans-germ Extra-anatomic Cell Therapy” (TECT). In both IECT and TECT the transplantation is extra-anatomic and the presently known mechanism of the transplanted cells in helping with the regeneration are different, however, the transplanted cells aid directly or indirectly with the anatomical regeneration and/or physiological recovery of the target tissue and thereby the organ. While it is to be noted that he mechanisms of such repair by these adult autologous cells in different applications vary from direct replacement of cells to aiding in repair by paracrine effect or secretion of growth factors and that the extent of such repair or regeneration too has significant variations, the significance of this categorization in future clinical therapy are worth a thorough investigation and evaluation and how we can harness the potential of this extraordinary transdifferentiation process for clinical benefits. Extra-anatomic transplantations of in vitro expanded mature adult cells, without any genetic manipulation or in vitro trans-differentiation, have yielded dramatic anatomical regeneration of the host tissues as well as physiological recovery. The fine details describing the transformation process between guest cells and the host tissues are incomplete. The principles underpinning this phenomena must be established to fully exploit its potential as a clinical therapy with broad application. The composition of the cell mass used as a source for transplantation therapy, in terms of stem cells, precursor cells and mature adult cells, as well as analysis of the functional uniqueness of the source vs target across these criteria of germ layers, organs, tissues and sites have to be thoroughly studied. Until pluripotent stem cell-derived clinical applications come into regular practice, such extra-anatomic adult cell therapies either IECT or TECT are worth studying as novel solutions to tissue regeneration. These are likely to evolve in the coming years and existing solutions could be enhanced using the principles behind IECT or TECT for diseases that do not have a definitive treatment. Knutsen G, Drogset JO, Engebretsen L, Grøntvedt T, Isaksen V, Ludvigsen TC, Roberts S, Solheim E, Strand T, Johansen O. A randomized trial comparing autologous chondrocyte implantation with microfracture. Findings at five years. J Bone Joint Surg Am. 2007;89(10):2105-12. Burman S, Sangwan V. Cultivated limbal stem cell transplantation for ocular surface reconstruction. Clin Ophthalmol. 2008;2(3):489-502. Tabakow P, Jarmundowicz W, Czapiga B, Fortuna W, Miedzybrodzki R, Czyz M, Huber J, Szarek D, Okurowski S, Szewczyk P, Gorski A, Raisman G. Transplantation of autologous olfactory ensheathing cells in complete human spinal cord injury.Cell Transplant. 2013;22(9):1591-612. Vaddi S, Godala C, Reddy V, Senthilkumar R, Srinivasan T, Reena H, Preethy S, Abraham S. Role of tissue engineered buccal mucosa for treatment of urethral stricture. Proceedings of the Annual Symposium & Plenary Session on Regenerative Medicine (PASRM). J Stem Cells Regen Med. 2013;9(2):40-7. Ebisawa K, Kato R, Okada M, Kamei Y, Mazlyzam AL, Narita Y, Kagami H, Ueda M. Cell therapy for facial anti-aging. Med J Malaysia. 2008;63 Suppl A:41. The editorial team would like to acknowledge with gratitude the inputs from Dr. David W Green (Faculty of Dentistry, The University of Hong Kong & Department of Oral Biology, Yonsei University College of Dentistry, Seoul, Korea) and Prof. J. Amalorpavanathan (Convenor, Transplant Authority of Tamil Nadu, India & Reader in Vascular Surgery, Madras Medical College, Chennai, India).